Pardon Will Power for declining to do the math relating to the Verizon IndyCar Series driver’s championship. After racking-up three runner-up finishes over the past four seasons, Power’s mantra for 2014 is refreshingly simple – screw the math. Victory in the season-opener on the Streets of St. Petersburg, Fla., and a second-place finish on the Streets of Long Beach have catapulted Power to the top of the point table heading into Sunday’s Honda Indy Grand Prix of Alabama. Power, of Team Penske, has a 27-point lead over Long Beach winner Mike Conway, a road-racing specialist with Ed Carpenter Racing who won’t be competing in the series’ six oval events through August. Simon Pagenaud, who along with Power is the only driver to notch top-five finishes in both races, is 33 points back as teams prepare for Saturday’s knockout qualifying session in Birmingham, Ala. BMP, which played host to its first IndyCar Series event in April 2010, has proven to be one of Power’s favorite venues. In four races around the 2.38-mile/17-turn road-course, Power has won twice – including from the pole in 2011– and topped the time sheet in preseason Open Tests the past two years. Will Power is Barber shopping this weekend. Ganassi Racing (by five points); Franchitti (18 points in 2011) and Ryan Hunter-Reay of Andretti Autosport (three points in 2012), respectively. Power’s back-to-back wins to close the 2013 campaign pushed him to fourth in the final standings topped by three-time champion Scott Dixon of Target Chip Ganassi Racing. Over the past 10 races, Power has recorded six top-10 finishes, including four wins that have boosted his career total to 22. “Last year, not being in the points chase, really opened my eyes that I was being way too conservative,” said Power, driver of the No. 12 Verizon Dallara/Chevrolet. “I had spent three years being very conservative, feeling the points. Actually taught me you just need to race hard no matter what. At the end of the year, it was fun. You can just race hard, it doesn’t matter. In fact, the results came a lot better when I did that. While a championship and Indianapolis 500 victory remain atop Power’s to-do list, Sunday’s 90-lap race at Barber has his immediate attention. Through the season’s first two races, 11 different drivers have advanced to the Firestone Fast Six of qualifications – the 10-minute session that determines the Verizon P1 Award winner and the first three rows. “A lot of teams now are really compressed. There’s no one that sticks out,” Power said. “Obviously, Ganassi was strong on the road and street courses last year. Every offseason, all these small teams, including us, you close the gap. The gap gets smaller and smaller. A total of 50 points have been deducted from Chevrolet’s Engine Manufacturer Championship total and Honda’s total has been reduced by 30 points for violations of INDYCAR’s engine sporting regulations. The Nos. 11 (Sebastien Bourdais), 12 (Will Power), 17 (Sebastian Saavedra) and 20 (Mike Conway) Dallaras with Chevrolet power and the No. 98 Honda-powered Dallara (rookie Jack Hawksworth ) were found to have violated rule 10.6.4 (non-minor engine repair). In accordance with the rule, 10 points will be deducted for an engine undergoing a non-minor repair that requires a component change, subject to INDYCAR approval. The engine will no longer be eligible for points from Rule 10.6.4.2. Additionally, both manufacturers were found to have violated Rule 16.5.1 (engine change under mileage). Chevrolet switched-out the engine in the No. 83 car (Charlie Kimball) before it met the 2,500-mile threshold, while the Honda engines in the Nos. 7 (rookie Mikhail Aleshin) and 77 Dallara (Simon Pagenaud) were changed-out. Members may contest imposition of the penalties pursuant to procedures and timelines detailed in the review and appeal procedures of the Verizon IndyCar Series rulebook. Chevrolet leads the Engine Manufacturers’ Championship, 197-112, heading into the Honda Indy Grand Prix of Alabama. Helio Castroneves has been placed on double secret probation through June 30, 2014, for violating INDYCAR’s Social Media Policy following the Toyota Grand Prix of Long Beach on April 13. Castroneves, of Team Penske, was found to have violated Rule 9.3.8. No specific reason for the action was cited by INDYCAR officials. But various reports indicated Castroneves posted a message on Twitter critical of series officials for a non-call on what the Brazilian believed should have been an in-race penalty. Moments after being posted, the tweet was removed from Castroneves’ account. Castroneves finished 11th in the 80-lap event. Driver of the No. 3 AAA Insurance Dallara/Chevrolet and 2010 winner at BMP, Castoneves may contest imposition of the penalty pursuant to procedures and timelines detailed in the review and appeal procedures of the Verizon IndyCar Series rulebook. 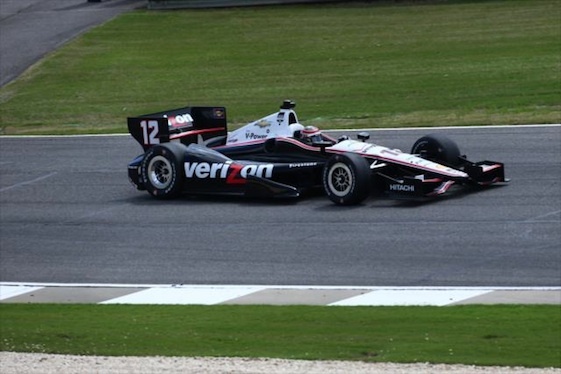 Reigning event champion Ryan-Hunter Ray topped both practice sessions Friday for Sunday’s Honda Indy Grand Prix of Alabama with a lap of 1 minute, 8.7836-seconds/120.378 mph in the No. 28 DHL Dallara/Honda. Sebastien Bourdais recorded a lap of 1:08.9331-seconds in the No. 11 Hydroxycut KVSH Racing Dallara/Chevrolet to finish second in the afternoon session. Josef Newgarden, who last April advanced from the 22nd starting position to ninth for his first IndyCar Series top-10, was second in the morning session to place third overall 1:08.9336 in the No. 67 Hartman Oil/Sarah Fisher Hartman Racing Honda. 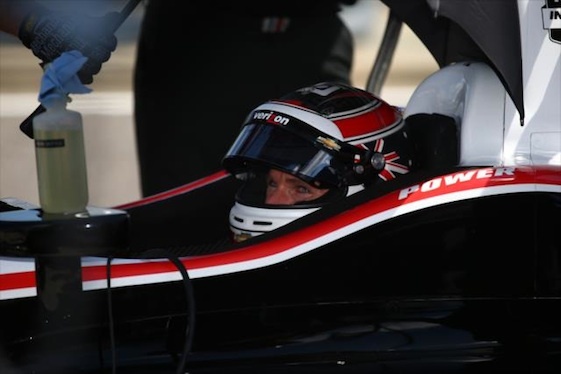 Will Power was fourth at 1:08.9746 in the No. 12 Verizon Dallara/Chevrolet while James Hinchcliffe was fifth at 1:09.0036 in the No. 27 United Fiber & Data Dallara/Honda. Sunday’s race will be televised live by NBCSN at 2:30 p.m. (EDT) and broadcast by the IMS Radio Network, including Sirius and XM Channels 211 and the INDYCAR 14 app for most smart phones and tablets. The Indy Lights Presented by Cooper Tires, final developmental step on the Mazda Road to Indy, will compete in the 45-lap Long Beach 100 on Sunday. The event will be televised at 5:30 p.m. (EDT). The Long Beach City Council unanimously approved an extension to the current Toyota Grand Prix of Long Beach agreement on Tuesday, securing the IndyCar Series event through 2018. “This will afford us the opportunity to continue to partner with the city in conducting the No. 1 street race in America for years to come,” said Jim Michaelian, president/CEO of the Grand Prix Association.